Mondaine launches an international innovation in the watch industry with the new series "essence." The first-ever watch created using a castor oil composite for the casing, Mondaine's SBB essence also uses natural rubber for its strap and comes in a reusable case made of recycled PET. Based on exploring these recycled and renewable raw materials, essence keeps the same Swiss Railways clock design sensibility, while pushing the brand - and the watch industry - to think about ways to create more sustainably. With SBB essence, Mondaine displays not only a spirit of innovation - as the first watch company to explore using castor oil in its manufacturing - but also a clear signal for sustainability and increasing the use of eco-friendly materials. "Better is Better! We want to make things better and show that sustainability can also be perfectly combined visually and technically with the most demanding products, such as a watch. essence is designed for a growing group of people - those who have opted for a conscious way of life with respect to their diet, their buying habits, or their determination for protecting our environment. 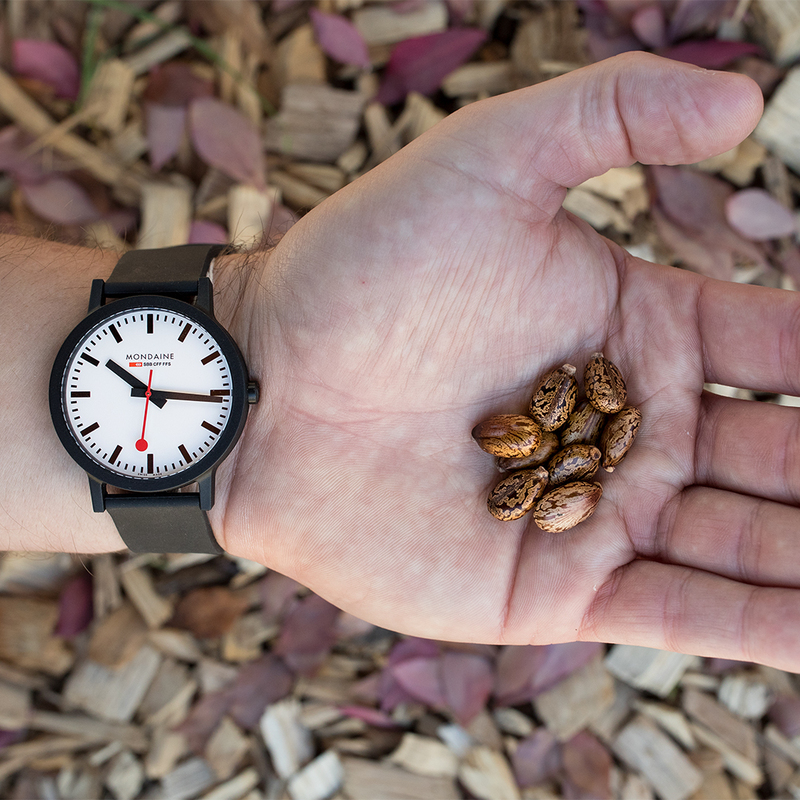 We are proud to launch a watch made from castor oil composite in collaboration with BASF and see this as a strong start toward growing sustainability. 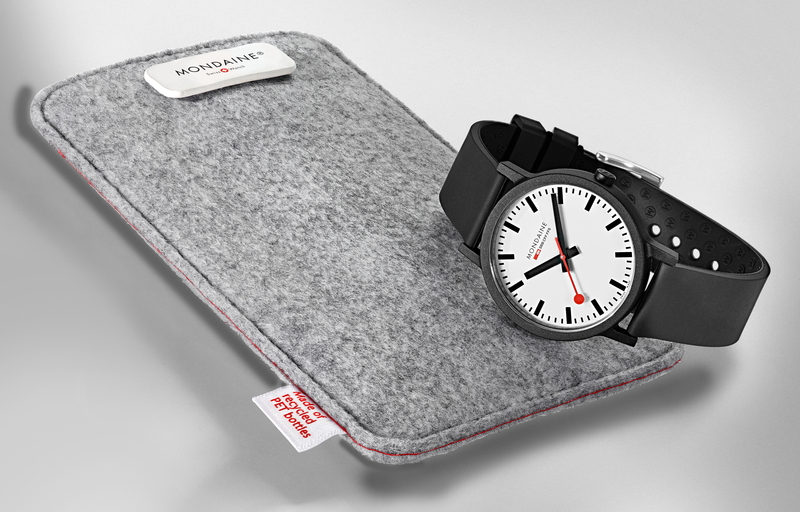 Our exploration of renewable and recycled materials has an added benefit of creating a Swiss-made timepiece which will be available for CHF 170.00," André Bernheim, CEO Mondaine Watch Ltd., explained. "essence" - a naturally beautiful design classic The SBB essence's clean and striking aesthetic is as significant as the modern materiality at its core. 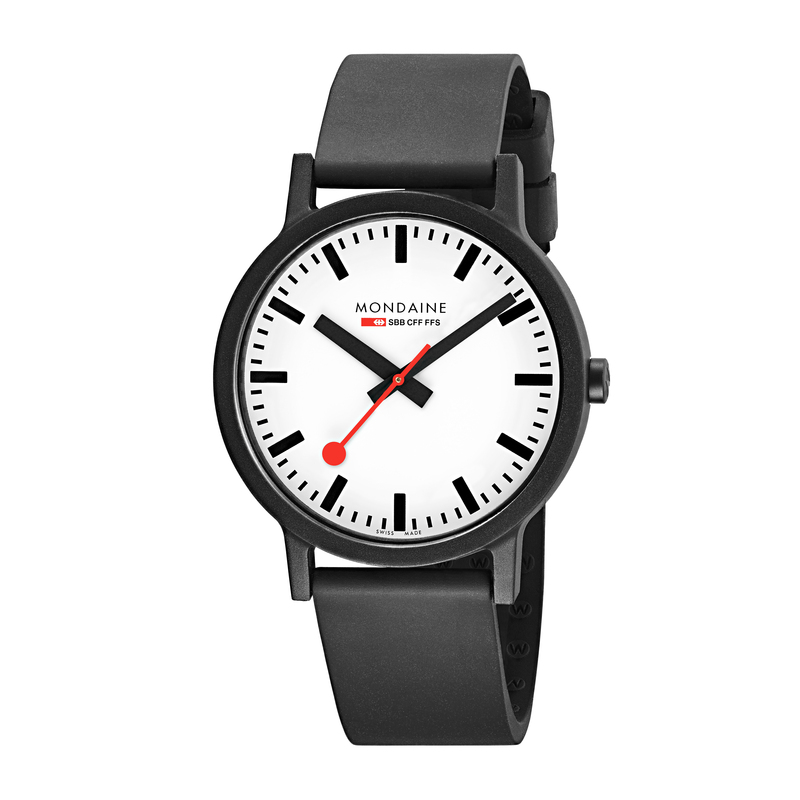 Welcoming an uncomplicated way of thinking and living, it features the sleek and streamlined iconic display of the Swiss railways clock, for which Mondaine is well known. And, in timeless style, it combines classic Swiss craftsmanship with innovative manufacturing methods. essence is composed mainly of renewable raw materials: The casing is made of 70% castor oil and glass fibers, and the watchband is made of approximately 40% natural rubber. Mondaine takes a holistic approach to the idea of the resource cycle. Consequently, essence is supplied in soft, gray felt-like packaging manufactured from recycled PET bottles that can be easily reused as a protective casing for mobile phones, sunglasses, and more.